Free Propel Electrolyte Water Meijer Coupon! Meijer has released a new coupon where you can get a free Propel Electrolyte Water! Log into your MPerks account TODAY and clip your coupon! No code needed, but you must load it today! Expires 8/29. … [Read more...] about Free Propel Electrolyte Water Meijer Coupon! Free Bic Crystal Pens Meijer Coupon! Meijer has released a new coupon where you can get a free Bic Crystal Pens 8 or 10 pk! Log into your MPerks account TODAY and use coupon code BIC to receive yours! Expires 8/29. (Thanks Christie!) … [Read more...] about Free Bic Crystal Pens Meijer Coupon! Free Kraft Mayo Or Miracle Whip Meijer Coupon! Meijer has released a new coupon where you can get a free Kraft Mayo or Miracle Whip 22 oz! Log into your MPerks account TODAY and use coupon code KRAFT to receive yours! Expires 8/28. … [Read more...] about Free Kraft Mayo Or Miracle Whip Meijer Coupon! Free Tena Liners At Meijer! Meijer shoppers, check your mPerks account! You should have a coupon for $4 off any Tena product. If you do, use it at Meijer to get a free pack of Tena liners! Here's your deal:Tena Liners (up to $4, should be in the $3-$4 range) Use $4 Tena Liners mPerks coupon Final Price: Free!You have … [Read more...] about Free Tena Liners At Meijer! Measuring Spoons Set Only $2.08 Shipped! 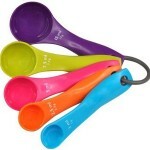 Amazon has this Measuring Spoons Set on sale for only $2.08 with free shipping!Made of non-toxic food grade material Set of 5: 1ml, 2.5ml, 5ml, 7.5ml, 15ml Color: blue, orange,pink, green, purple Hanging ring keeps each nesting set together for storage and separates for easy use and … [Read more...] about Measuring Spoons Set Only $2.08 Shipped!